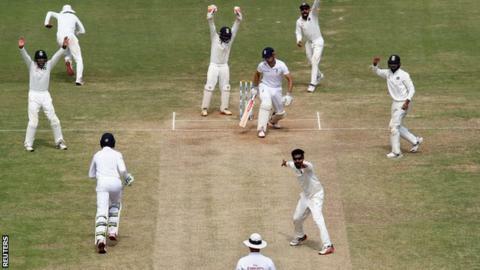 England suffered a dismal batting collapse to slip to an innings-and-75-run defeat on the final day of the fifth Test against India in Chennai. Behind by 282 on first innings, England were taken to 103-0, but then lost four wickets for 26 runs. They looked to have been steadied until Moeen Ali played an awful swipe at spinner Ravindra Jadeja, who took 7-48. The last six wickets fell for 15 runs, with England all out for 207 to give India a 4-0 series win. England have now lost six of their past eight Tests, seven of which have come on a gruelling tour of Bangladesh and India, where alien conditions have highlighted familiar weaknesses in their batting and spin bowling. They do not play another Test until July, by which time they may have a new captain, with Alastair Cook admitting to having questions over his future. "Normally, they sack losing generals," said former England batsman Geoffrey Boycott on BBC Test Match Special. "You've got to do something about it. "England pay the coaches and the director of cricket fortunes, but nothing will happen. They will beat people in England on seaming pitches and everything in the garden will be rosy." England suffered an innings defeat in the fourth Test after making 400 batting first, but suffered a greater indignity here. Their first-innings score of 477 is the highest by any side that has gone on to lose by an innings. All five of England's defeats this winter have involved at least one batting collapse, but this one was particularly feeble, given that a surface on which India made 759-7 the previous day had barely deteriorated. With left-arm spinner Jadeja in the thick of the action, England's shot selection contributed to the fall of four wickets in 14 overs after lunch. Cook pushed a leg-side delivery from Jadeja to leg slip and opening partner Keaton Jennings prodded a return catch to the same bowler, who then had a sweeping Joe Root lbw on review. When Jonny Bairstow clipped Ishant Sharma straight up to be brilliantly held over his shoulder by a sprinting Jadeja, England had slipped from 103-0 to 129-4. Moeen had actually helped steady England after their initial slide, adding 64 with Ben Stokes in 19 overs. Both needed luck - Moeen struggled against the short ball while Stokes edged through a vacant slip area - but the draw looked to be the most likely result when Moeen played an inexplicable stroke. Advancing down the pitch, the left-hander looked to hit aerially down the ground, but only found Ravichandran Ashwin at mid-on. From there, the match was lost inside 16 overs. In total, all 10 wickets fell for 104 runs. Moeen c Ashwin b Jadeja 44 (192-5) - An awful stroke, needlessly attacking when defence was needed. Stokes c Nair b Jadeja 23 (193-6) - A tame pat to mid-wicket. Dawson b Mishra 0 (196-7) - Failed to pick a googly and was bowled. Rashid c Jadeja b Yadav 2 (200-8) - A leading edge to the first delivery from the second new ball to be caught at point. Broad c Pujara b Broad 1 (207-9) - Gloved to short leg. Ball c Nair b Jadeja 0 (207 all out) - England's number 11 lasted only three balls, the collapse complete and the brilliant Jadeja finished with career-best figures. Cook has said he will meet England director of cricket Andrew Strauss in January to decide on his future as captain. If this was his final innings as skipper, it looked set to be a characteristic rearguard in partnership with Jennings, who followed up with a century on his debut in the fourth Test. Both were dropped in the morning session, but Jennings in particular looked assured with reverse-sweeps and clips through mid-wicket until Cook's loose flap at Jadeja, who dismissed him six times in the series. From there, an increasingly dejected and forlorn Cook could only watch as his team disintegrated. After the match, he said that it was "not the place" to be answering questions on his future. "I've got to go home and do some thinking," he added. Cook made a comment before the tour about how it might be his last. After we've lost the series, he says Joe Root is ready for captaincy, and nobody forced that out of him. So this must have been on his mind for some time. It hasn't just suddenly happened. Whoever captains in England this summer has seven Tests before the biggest series of all in the Ashes. If we're to have a new captain, he needs all seven Tests to get his feet under the table, we don't want Alastair giving it up after three or four Tests. What Alastair Cook feels about this and how it influences his decision about his future as captain I'm not sure. Supporters knew this would be a tough series. England were undermanned and underpowered, but they would have wanted some fight today to not lose this match to show character, but I think fans will be upset by this and the manner of the defeat. England captain Alastair Cook: "I don't think we ran out of fight. All the guys gave their all, we just weren't good enough. We've struggled to take 20 wickets and we haven't got enough runs so we probably didn't deserve it. "We've dropped vital chances and India kept punishing us. It's been a series of missed opportunities. We tried as hard as we could, but it wasn't good enough." England assistant coach Paul Farbrace: "Today was a day we could have batted the day out and we just weren't good enough. Too often we have lost wickets in bundles and you can't do that against a team like this. We played some really good cricket but you can't play for just a few session in a Test match." India captain Virat Kohli: "We understood what would happen to England if we got a couple of wickets. The intensity was top class." England have lost four Tests in a series against India for the first time. India have extended their unbeaten run to 18 Tests, a record for India and the joint-third longest run of all time. They have also gone 19 home matches without defeat, a run dating back to 2012. They have won 16 of those matches. In the fourth Test, England became only the third side to lose a Test by an innings after posting 400 or more batting first. Here, their 477 is the largest total by any side that subsequently lost by an innings. Read more on Do Stokes, Broad & Cook make it into your top 10 of 2016?